Today’s security management problem isn't a lack of information, it is not being able to collect everything that is happening in my infrastructure, identify the threats and incidents and putting in place a process to prioritize your incidents to act decisively. The problem is that you just cannot rely on your current way of thinking and approach with the types of advanced threats that can impact your organization. The key to successful security and risk management practice is in converting raw data into actionable intelligence that informs and drives the investigation, prioritization and incident management process while at the same time provide business context on how the incidents could impact the risk to the organization as a whole. Getting the information to the person is no longer enough. Now, as security professionals, we need a new model, new ideas and a new approach to combating advanced threats. 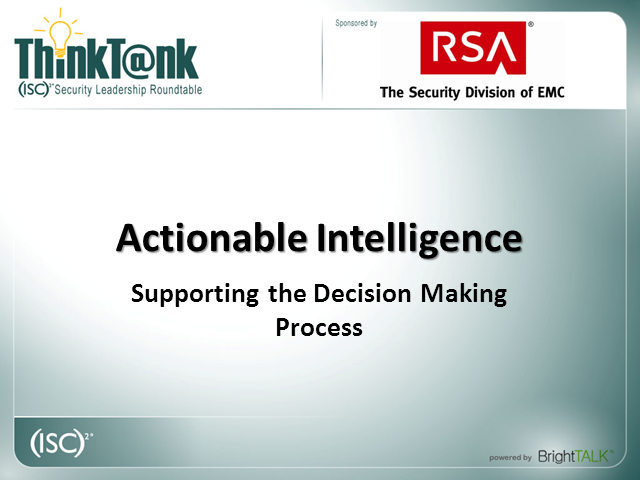 Join us on April 12, 2012 at 1:00pm Eastern time with RSA, The Security Division of EMC as to learn how you can transform the approach you take to security operations and your profession as a whole.